Wild type plac-FixK2 hybrid promoter is a promoter which can not only be activated by light sensor parts YF1-FixJ but also inhibited by LacI repressor. The sequence of the upper control element and core element region are from wild type FixK2 promoter and based on the genomic sequence of Bradyrhizobium japonicum. Additional lac operators were introduced to both sides of the promoter as second control elements which result in transcription repression. In order to test the hybrid promoters, we constructed five composite parts with mRFP gene as reporter (BBa_K19103027, BBa_K19103028, BBa_K19103029, BBa_K19103030, BBa_K19103031). These composite parts were co-transformed with the light sensor part (BBa_K19103034) into E.coli strain BL21, cultured under dark for 24h and their fluorescence was tested. We included as controls cells that only contained the Fixk2 composite parts. 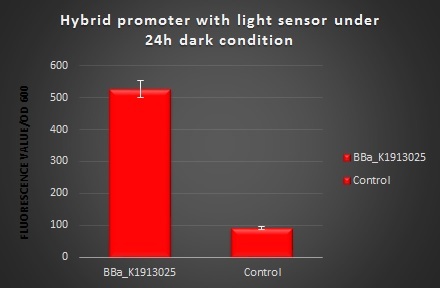 The results (Fig.1) illustrated that hybrid promoter BBa_K1913025 has 5 times significant different compared to control, which suggested that this promoter is the most sensitive one for being induces by FixJ. 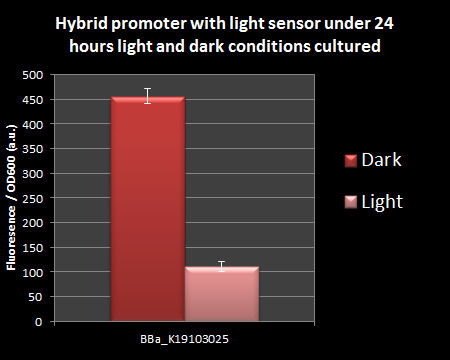 Also, BBa_K19103025 showed light sensitivity (Fig.2) under 24h light and dark condition culture. Figure 1. Ratio of fluorescence value and absorbance of Fixk2 composite. Fixk2 composite and control was cultured under dark condition over 24h. Emission and excitation wavelength of mRFP are 607 and 584 nm respectively. Figure 2. Ratio of fluorescence value and absorbance of Fixk2 composite. Fixk2 composite was cultured under dark and light condition over 24h. Emission and excitation wavelength of mRFP are 607 and 584 nm respectively.